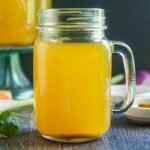 This Instant Pot vegetable sipping broth is healthy and tasty to sip through out the day when you are dieting or if you are feeling under the weather. Can also be used for cooking or as a base for soups. Add all ingredients to your Instant Pot. Place the lid on and lock into place. Turn the pressure release to the back to create pressure. Hit the manual button for 30 minutes. When broth is done, either let the pressure release naturally or instantly. Strain and store in containers. I like to store 2 cups per container in the freezer and take them out as I need them.